As we approach the ACT Aspire testing in the Middle School, I am reminded that even just the word “assessment” or “test” can bring on feelings of stress, anxiety, or dread. And certainly, there are few conversations that garner more opinions or positions than that of assessment and testing in education. I wanted to take a moment to share with you what I hope is a more robust and thoughtful rendering of assessment and its implications for learning and teaching. More, I want to share with you, fellow parents, some thoughts on how you can be supportive of your students as they move through their educational journey with assessment. 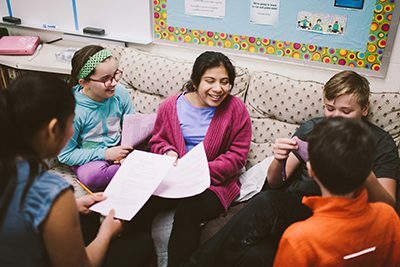 Assessing what children know alongside how they learn is the fundamental project of schools—to understand what knowledge young people bring with them into the classroom and to facilitate the development of growing understanding. Years and volumes of educational research has explored various assessment strategies, techniques, and processes as well as the promises and pitfalls of educational testing—specifically those standardized measures we encounter so often in schools. While these tests provide some insight into learning trends and are benchmarked comparisons to other test takers of like age and grade, these measures of learning are not wholly adequate in painting a complete picture of what our children know and are able to do. Schools, including ours, are widening their assessment and measurement lens with new knowledges and findings in the cognitive sciences and learning theory. Teachers and education professionals are embracing creative and performance-based evidences of learning through design-thinking and problem-based learning. Assessment that is formative, ongoing, and offers substantive feedback to students is preferable and honor the goal of education. If our goal is to capture and understand what children know and are able to do, we must not rely solely on one measure. Learning and teaching are dynamic, complex, and multifaceted and our assessments must keep pace in order to fully realize students’ potential. With this in mind, as parents, our role is to thoughtfully encourage a balance in focus and performance as our young people encounter tests and standardized assessments. We should urge our students to do their best and also remind them that the assessment is but one measure of their learning—not the sum of their ability or character. The most important part of any assessment is that students take an active and engaged role in the learning prior to the moment of measurement. More, in order to lessen anxieties and stress, it is important that students eat well, get enough rest, and feel emotionally, mentally and physically prepared to do well. 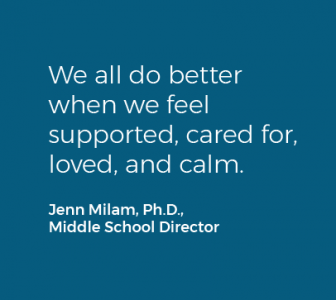 We all do better when we feel supported, cared for, loved, and calm. MPA teachers value all parts of the beautiful, complex, and messy parts of learning and assessment. Our students investigate and consider multiple perspectives across disciplines before transforming their learning into demonstrable evidence of understanding. We value our partnership with parents and families in this journey and we thank you for playing a supportive role as we approach formal assessment.